Editor’s note: I went to see Lauren after breaking two fingers in three places this past fall. Physical therapy could not address the excess scar tissue in the affected joints. After eight myofascial release treatments, I now have full use of my fingers again. I am grateful for this healing modality and want to share it with you. Do you have pain left over from a cancer procedure that physical therapy has not helped reduce? Do your scar tissues and the areas around them still hurt? It might be time to consider myofascial release. “Myo” means muscle and “fascia” means connective tissue. This safe and effective hands-on technique involves applying gentle, sustained pressure into areas of the body that are restricted, dense, and tight. This process decreases the tightness to alleviate pain, reduces the thickness of scar tissue, and helps restore normal sensation and motion. Myofascial restrictions can be caused not only by surgeries to remove cancerous tissue, but also by chemotherapy and radiation. Breast cancer patients, for example, undergo lumpectomies or mastectomies that leave behind scar tissue. Even without surgery, these patients may develop fibrotic tissue as a direct result of chemotherapy or radiation. Scars also can grow inside the body like vines, reaching into other regions of the body, like the respiratory diaphragm and into the neck and shoulders. Patients may experience pain in the neck, shoulders, and upper back after treatment for breast cancer. Patients who have been treated for cancer in other areas may experience pelvic, back, and leg pain. This tissue resembles what I like to describe as “a wet sponge drying out to a dry sponge.” The tissue feels thick, tight, and gristly when palpated or touched. The trauma and inflammatory responses in the body create myofascial restrictions with tensile pressures of about 2,000 pounds per square inch on pain-sensitive structures. That’s a lot of pressure. These restrictions do not show up in many standard tests (including x-rays, myelograms, CAT scans, or electromyography). Instead, they are detected using palpation, or touch. Once scar tissue has formed, myofascial release techniques applied below and above the scar region can be helpful in eliminating the pain and softening the scar. It can be extremely helpful in improving tissue mobility, pliability, and hydration. The time element in MFR treatment is vital. It is essential that the practitioner apply sustained pressure to the tissue for a minimum of 90 seconds. This low-load gentle pressure applied slowly will allow the connective tissue to soften and elongate. Being free of pain and being able to move more freely can help provide emotional benefits for those treated for cancer. Cancer treatment should not end with interventions to treat the cancer. Too often patients are left with residual problems, some of which can be addressed with MFR to help them return to more optimal health. If you or someone you know has been down this road, consider adding myofascial work to the health care plan. Balance the soft tissue, decompress the joints, alleviate the residual pain, and restore your energy. Rachel was an early biblical character who died giving birth to her second son. She was buried by the road to Bethlehem. Bethlehem would later become the birth location for a king, according to Matthew’s gospel. And Herod, the jealous and frightened ruler at the time, sent his soldiers to kill all the male infants and toddlers near Bethlehem to remove this new threat. One cannot imagine the kind of imperishable grief such an act would produce on a vulnerable population. This story is part of the birth narrative of Jesus. When was the last time you heard a preacher talk about this trauma in connection with the nativity story? It seems to me that mothers who grieve their children appear easily overlooked. With the current opioid epidemic, mothers who are cancer patients need to be wary. I was told in 2011 to “stay ahead of the pain,” and was sent home with a month’s supply of what I now realize were heroin pills. Recently I talked with a cancer survivor who also had leftover opioids and a teenaged son at home. I urged her to get a digital lockbox or return the pills to a pharmacy. Even if her son doesn’t find or use them, a friend of his might. Then the treacherous slide into heroin overdose begins. I’m hardly alone. Even my son’s memorial garden was just visited again by Rachel’s weeping. A mother bird in the sweet gum tree had fought valiantly for her eggs, evidenced by the circle of feathers; but her efforts simply weren’t enough. The nest fell to the grass and her babies were hungrily consumed. Mother’s Day is approaching. Ugh. For me, and for perhaps hundreds of thousands of mothers, this time on the calendar is a terrible reminder of broken hearts and empty arms. Despite all we do, sometimes we still lose our children. Some mothers lose their only children—I know two such women who lost theirs to heroin. I have heard of one woman who lost all three of her children to heroin overdoses. Losing your children is bad enough. Add on the stigma of death to drugs and you have an unfathomable nightmare. I am most fortunate that one of my brothers will be here and we will spend the day making and eating delicious meals our mother made when we were growing up—a time of innocence. My younger son will get to indulge with us. (He loves to tell me there’s no food in my house.) Foods I typically now avoid, yet that give comfort and solace to an empty heart. Corn fritters, hamburger pie, cheesecake, springerle. I’ll still be weeping for my child, as I do nearly every day, yet with social support I also will have some consolation. CureToday magazine posted this article as my story. Note that it is best to talk to a health care provider before making changes based on these 7 tips. If you click on the link and look at the article, that will help prompt CureToday to invite me to write more articles. It also will be helpful for getting the word out. Even better if you share the link. Thank you! From 1988 to 1993 there were over 2,700 articles dealing with milk recorded in the ‘Medicine’ archives. … They were only slightly less than horrifying. First of all, none of the authors spoke of cow’s milk as an excellent food, free of side effects and the ‘perfect food’ as we have been led to believe by the industry. The main focus of the published reports seems to be on intestinal colic, intestinal irritation, intestinal bleeding, anemia, allergic reactions in infants and children as well as infections such as salmonella. … Contamination of milk by blood and white (pus) cells as well as a variety of chemicals and insecticides was also discussed… In adults the problems seemed centered more around heart disease and arthritis, allergy, sinusitis, and the more serious questions of leukemia, lymphoma and cancer. Juice, milk, something processed, sugar/corn syrup drinks and processed puddings containing artificial ingredients. While staying in the hospital after my abdominal surgery, I was started on a clear liquid diet. Then I was moved to a “full” liquid diet. It consisted of adding dairy, wheat, sugars, and petrochemicals to the menu through milk, ice cream, cream soups, and artificial colorings and flavorings. Fortunately, before the surgery, I was able to talk to a hospital dietitian to let her know my body does not properly digest dairy or wheat, I did not want sugar, and I needed a substitute with protein. She suggested soymilk. Too estrogenic for me with my cancer background, I said. She was temporarily at a loss for how to help me get something more substantial on my “full” liquid day. Then she remembered she could get me some almond milk. That works for me, I said. I knew this would be a problem because the last time I went through abdominal surgery I was still limited to clear liquids during the 24 hours when I was supposed to get “full” liquids. I felt like I was starving after not having eaten for more than a week. I desperately needed protein and the hospital did not supply any. The almond milk option indicated to me that hospitals are getting a little more up to speed on what actually is nutritious and what is not. Another indicator is the hospital-floor refrigerator unit available to patients. When I stayed in the hospital years ago, those refrigerators were full of sodas. I cannot imagine anything worse for someone and who has had abdominal surgery than to add carbonated beverages that fill the abdomen with even more gas than is already added through surgery. My hospital roommate 25 years ago was drinking soda and complaining bitterly of her terrible gas pain. She did not make the connection between the soda gas and her gas pain. So I am grateful hospitals are moving in the right direction. However, there is still work to be done. I needed something substantial without dairy, wheat, sugar, or petrochemicals. I am grateful they did have the almond milk option. And the hospital refrigerators… see the pictures of what they offered. Items filled with dairy, sugar, and long lists of unpronounceable chemicals. Really? For people whose bodies are so compromised they are in hospital beds? Since when do sugar and corn syrup support advanced recovery? Where are the fruit and vegetable smoothies? Where are the probiotic drinks? Or perhaps even trays of fresh fruits and vegetables for those ready for them? Perhaps part of the reason the hospitals are not supplying these foods is because Americans are not used to eating them and therefore the foods might rot in the fridge unless health nuts like me come along to eat them. And real food is more expensive than these standard options. Hospitals probably don’t have big enough budgets to provide real food for every patient. If you are going to stay in the hospital, find someone to bring you better quality food for each stage of recovery. My bowels well up, and rest not; days of affliction have confronted me. From Dec. 12 to 14 I sat in my easy chair in pain, my bowels welling up, gassy, and juicy. My stomach kept emptying itself into the pot I kept handy. Hot water bottle, massage, playing healing sounds… all to no avail. Nothing could go down, nothing was coming out. I finally called my doctor. “Get Thee to an ER,” he said. When we hung up, my friend Laura Dailey, whom I had not seen in weeks, was parked on my driveway. What an angel she has always been for me. She promptly took me to the hospital. The ER doc found a twisted small intestine on the CT scan, something I’d been warned could easily happen after my initial nine-hour cancer surgery in 2009. In 2011 I had an intestinal blockage that resolved, and in 2012 a hernia had been spotted on a scan, but my oncologist suggested I leave it alone unless it became a problem. It had become a problem. I texted my 19-year-old son to update him on my status. He dropped everything, went to my house to pick up a few more things, and came to the hospital to stay throughout my days of affliction. I feel so blessed. A stiff yet flexible plastic gastro-intestinal tube was placed through my nose down to my stomach. I’d had one in 2009 for my first cancer surgery, but it was placed while I was under anesthesia. This time they placed it with me fully awake. One nurse said, “This is the worst torture we do to our patients.” I had to keep my head down and swallow a cup of water while the nurse struggled to get that hose down into my gullet. I gagged and coughed as it went down, then suddenly felt very cold and shook violently for several minutes. The severe throat pain began. The next morning the surgeon said portions of the intestines had poked through the hole and could die if he didn’t operate. 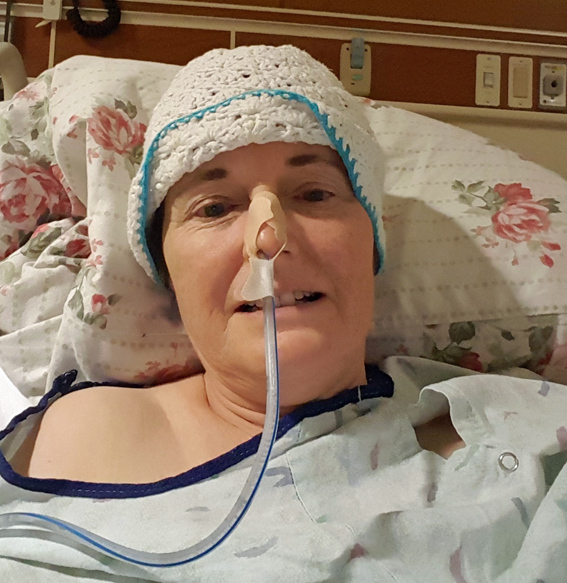 My sister, epidemiologist Dr. Roselie Bright, participated in the conversation by phone and urged me to move forward with the surgery, even though my abdomen had started softening. I opted for surgery. There was no time to pick up the Surgical Support Series CDs from my psychotherapist. As a substitute, I repeatedly played tai chi Grandmaster Vince Lasorso’s “Relief” recording through my Wholisound Serenity Box using a new portable CD player Laura bought me for this purpose. Laura alerted people via Facebook. Many thanks to all who supported and prayed for me! It was another 12 hours—Thursday night—before I was wheeled onto the operating table. The surgeon updated my Superwoman abdominal scar with a 4-inch replacement. With pain medication the tube was more tolerable, but talking still was quite difficult. What a blessing to get that tube pulled on Saturday! That enabled me to get off daytime pain medication (which distressed the nurses) and then off all medication when I went home Sunday, 2.5 days before expected. My days of affliction are over and I’m recovering well. I am thankful for the miracles of modern medicine. The nurses were distressed about my not taking daytime pain medication or taking home a pain prescription. “You need to stay on top of the pain,” I’ve been told. Well, I didn’t have pain. I only had discomfort. Part of the reason, perhaps, is because my inflammation level normally is extremely low (0.3 on a scale of 1 to 4). I keep it low with my diet. A lot of pain comes from inflammation, so without excess inflammation, injuries ares much more tolerable. If you are in pain, try reducing inflammation in your body by avoiding inflammatory foods, which can be measured with a blood test looking for C-reactive protein. Advances in LeioMmyoSarcoma surgery was addressed briefly Oct. 8 at the National Leiomyosarcoma Foundation patient symposium in St. Louis, Mo. This was one of several cancer treatment topics that I am reporting about during the coming weeks. Jeffrey Moley, associate director of the Siteman Cancer Center, said LMS can occur anywhere in the body and has a 50 percent mortality rate. It most commonly is found in the extremities of the body. Nineteen percent of sarcomas are LMS. High-grade LMS has a greater than 50 percent chance of metastasizing; low-grade has a less than 15 percent chance. Sarcomas are the only cancers that are graded. During surgery, the doctors always try to get a negative margin. To avoid amputation, one good option is to do limb-sparing surgery followed by radiation. This decreases the chance of a local recurrence by 30 percent. MRIs and CT scans give pretty much the same information to the doctors. The definitive treatment is complete surgical resection. For abdominal and retroperitoneal tumors, sometimes repeat operations can be very effective, especially for low-grade sarcomas.